Since 2012, The International Journal of Science and Research (IJSR) is a Peer Reviewed, Open Access International Journal. 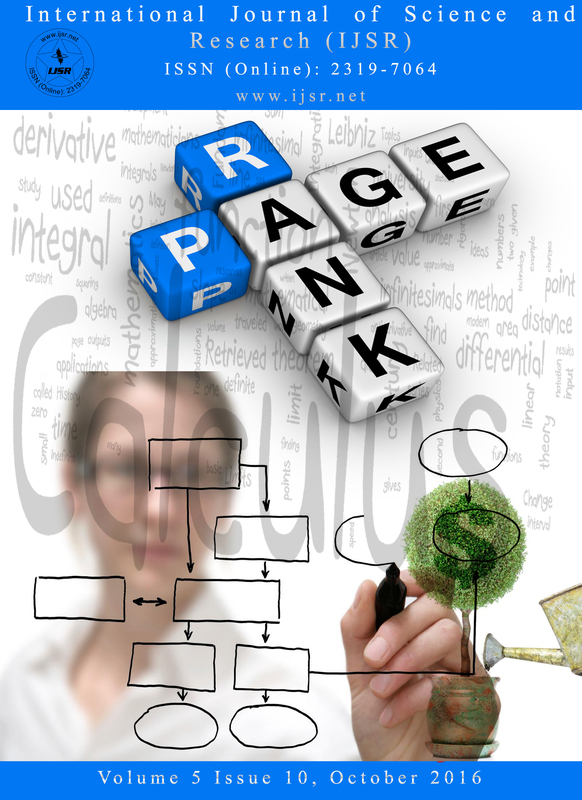 Notably, it is a Referred, Highly Indexed, Monthly, Online International Journal with High Impact. 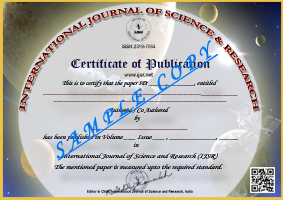 International Journal of Science and Research (IJSR) is published as a Monthly Journal with 12 issues per year. We also assist International and National Conference to publish their conference papers. 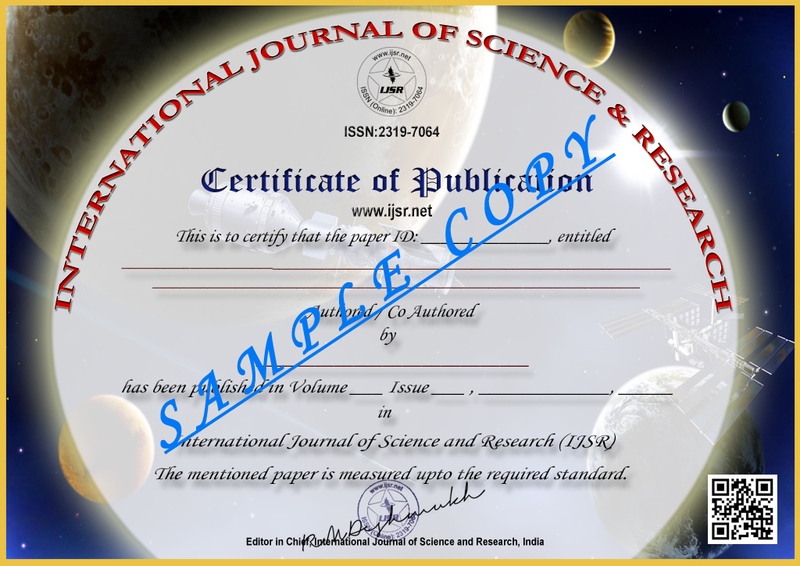 International Journal of Science and Research (IJSR) covers all disciplines including Arts, Science, Commerce, Social-Sciences, Management and Engineering. International Journal of Science and Research (IJSR) always strives to be a platform for Academicians, new Researchers, Authors, Engineers and Technocrats and Engineering Scholars. Since inception, International Journal of Science and Research (IJSR) is continuously publishing original and best quality research articles. International Journal of Science and Research (IJSR) invites you to submit the paper via Online Submission System or through E-mail at editor.ijsrnet@gmail.com. Make sure that submitted manuscript should not have been submitted or published previously anywhere else for publication. It is strictly advised to submit original and plagiarism free articles only for possible consideration, else they will be rejected without any response. All received manuscripts will go through Double Blind Peer Review and final decision shall be based on the high level of quality, originality and additional contribution to the existing knowledge. Very Important: Once your article is submitted to International Journal of Science and Research (IJSR), you cannot submit / present this paper anywhere else, unless your article is Rejected. Neither this paper will be withdrawn nor will be presentable in any other journal / conference / magazine or any media without the permission of the International Journal of Science and Research (IJSR). Why to Publish with International Journal of Science and Research (IJSR)? The International Journal of Science and Research (IJSR) aims to establish itself as a platform for exchanging ideas in new emerging trends that needs more focus and exposure and is always committed to publish articles that will strengthen the knowledge of upcoming Researchers and Scientists. International Journal of Science and Research (IJSR) follows Open Access as a publishing model. This model provides immediate, worldwide, barrier-free access to the full text of research articles without requiring a subscription to the articles published in this journal. In this model, the publication costs are covered by the Author / Authors Institution or Research Funds. Published material is freely available to all interested online readers. At the same time, authors who publish in International Journal of Science and Research (IJSR) retain the copyright of their article. The opinions expressed in any of the published articles in this journal are not the opinions of International Journal of Science and Research (IJSR). The Content is not guaranteed to be complete, correct, timely, current or up-to-date. Similar to any Printed or Electronic materials, the Content may become out-of-date. International Journal of Science and Research (IJSR) undertake no obligation to update any Content on our Website. Respective Authors of that particular article are responsible for their own content, where applicable, and may update their Content at any time without notice and at their sole discretion. International Journal of Science and Research (IJSR) reserve the right to make alterations or deletions to the Content at any time without notice. International Journal of Science and Research (IJSR) do not represent or otherwise warrant that the information available on or through our Website will be correct, accurate, timely or otherwise reliable. International Journal of Science and Research (IJSR) may make changes to the features, functionality or content of our Website or Services at any time. Any research content provided by our Authors are of the Author’s opinion, and is not intended to malign any religion, ethic group, club, organization, company, individual or anyone or anything. International Journal of Science and Research (IJSR) reserve the right in our sole discretion to edit or remove any documents, information or other content appearing on our Website or Services. Any errors discovered are the fault of the authors. In no event shall International Journal of Science and Research (IJSR) be responsible or liable, directly or indirectly, for any damage or loss caused or alleged to be caused by or in connection with the use of or reliance on any such content, goods, or services available on or through any such site or resource.